Last week I did something totally new and collaborated with my team mate Moira “Slam-wise” Hershey for a roller derby event poster. I drew the design and Moira coloured it and added the text – I think it looks pretty sweet and I am totally going to hit her up (pun intended) for her digital colouring techniques AND OH MY GOD THAT TEXTURE. I’ve been skating with the Upper Valley Vixens for over a year now and it was a blast to give something back from the creative side of my brain. 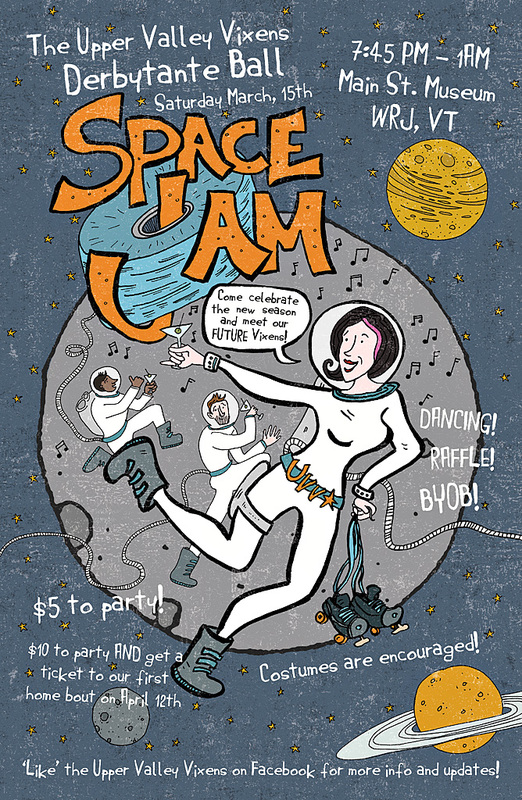 If you’re in Vermont or New Hampshire in March, you should totally come to the Space Jam ball – it’s going to be amazing! Check out some other illustrations I did recently for Narrative.ly’s ‘Secrets of Ivy League Tour Guides’.